The Circle of Westphalia, Drawn from the Latest Authorities. A finely detailed first edition 1794 map of Westphalia by Robert Wilkinson. While the name 'Westphalia' is used for several different overlapping areas in central to western Germany, this map shows the area from the North Sea and the Netherlands in the upper left, to France in the lower left, and from the Hamburg in the upper right to the Upper Rhine in the lower right. 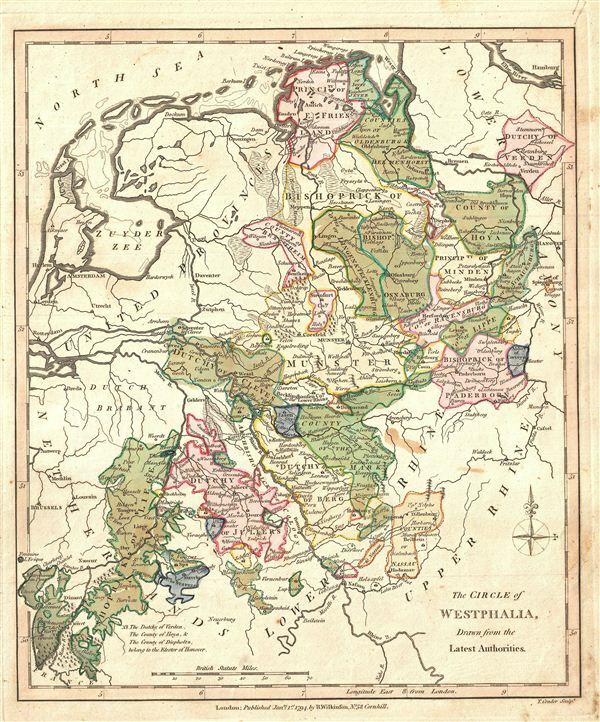 The map outlines the feudal Duchies and Counties of Westphalia as they were before being joined with other Prussian states in 'The Kingdom of Westphalia,' briefly a French vassal state under Napoleon from 1807-1816. The area was made famous in 1648 when the 'Peace of Westphalia' was signed in Münster and Osnabrück, ending the Thirty Years' War.